Petsmart has these New Gingerbread men plush dog toys that come in two sizes. With a nice appliqué border around the edges, a bright red bow tie, mint buttons and sweet smile, these Gingerbread Men are ready for your best buddy. 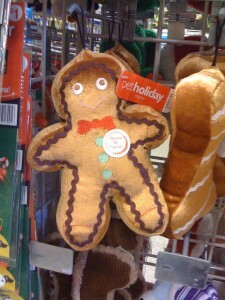 My sweet Bichon Frise puppy dog will be getting one of these plush Gingerbread man toys for Christmas!